Why did he doubt? Perhaps Peter doubted because the wind tore through his clothes and threatened to drown him. Or maybe he doubted because as a life-long fisherman he knew the destructive nature of the elements. He may have doubted because after daring to step out of the boat he felt overwhelmed by the world crashing in around him. Worry and perfectionism: my worst enemies and constant companions. Because of this, there are times when I feel overwhelmingly anxious. Like Peter, I feel as though I’ve taken on more than I can handle and watch helplessly as I become overwhelmed. It’s as though I know I need to work, but I’m afraid my best will fall short. The tension inside me grows until I feel like I could snap under the pressure – but I don’t. I stand there, exhausted, unsure of how to move forward. Working myself to exhaustion and allowing myself to succumb to life’s cares is NOT God’s plan for my life. He tells the apostles on the boat that they should not be afraid of the storm, and he tells us as well. I know that I must rely on Christ for strength and trust that he’ll supply what I need to succeed. Although it’s never easy, one way I’ve begun to rely on the Lord is to notice warning signs that appear whenever I’m becoming overwhelmed. For me, these signs begin benignly as a few restless nights, but devolve into exhaustion and irritability, which affect every relationship in my life. I become selfish. Worrying about my own life makes me lose sight of God’s hand stretching out to me across the water. Losing sight of God ensures I will lose sight of the needs of others. Understanding the signs begins with understanding and admitting my own weaknesses. Like Peter I fall prey to the temptation to forget God’s promises and rely ­­on my own merits. Yet the older I become, the more I realize my own inadequacies in the face of this world. On my own I’m weak, but by admitting that very fact I open my heart to God’s mercy. Being open to God’s grace requires me to know my own limits. It provides me the freedom to pause, think, and acknowledge where my strength ends and God’s begins. Chances are, if I’m feeling overwhelmed, it’s because I’ve pushed myself too far and need to reevaluate my commitments. Personally, I’ve always loved tackling seemingly insurmountable workloads. Overextending myself to work, volunteering, and searching for full-time careers after college often leaves too little time to invest in relationships with my friends, family, and God. I’ve had to learn the hard way that doing things for God is not the same as beingwith him. More than once, I’ve grown overwhelmed because I’ve pushed myself beyond my limits for the sake of good things such as ministry, work, and school. Sadly, the first thing to disappear when I grow busy is the ten minutes of personal prayer time I usually devote to God. This never works. I trick myself into believing that fifteen minutes would be more productive doing other things than listening to God. When in reality, those fifteen minutes keep me grounded in the truth that what I do only matters when it glorifies God. Knowing your limits allows you to discern what path to take and when to say ‘no.’ It serves as a simple way to keep yourself from falling prey to the pressures of doing too much. At this point, you might be asking, “So what? How does stopping yourself from becoming overwhelmed help me find God if I’m already feeling overwhelmed?” My advice would be to follow Jesus’ own example. Prior to walking across the water towards his disciples, Jesus, “Went up on the mountain by himself to pray. When it was evening he was there alone” (Matthew 14:23). Even Jesus paused from his work to retreat and pray. It may be a struggle to put off the work. It may even seem counter-productive to leave it until the next day, or the day after that, but it’s worth it. Start by acknowledging little, daily blessings. Give thanks. Rejoice in God’s constant love. Remember the promise that our Father will strengthen us by his Spirit. Finally, make a choice to submit your struggles to God on a daily basis, no matter how challenging it may be. The surest way to find God when you feel overwhelmed is to pursue him, and trust in his grace. Peter called to Jesus while the waves threatened to engulf him. We too, must learn to call out to God when we feel overwhelmed. Remembering that God has everything under control gives us the freedom to rest from whatever is overwhelming us. God, we know that you have a plan for our lives – even if we can’t see it. Please help us to turn to you in prayer whenever we feel overwhelmed. Show us your constant love and care. May we dedicate our struggles to you, and glorify you through all our work. Please pour forth on us your strength that we may reach for your outstretched hand and witness to you in our weakness. We ask this through Jesus Christ, our Lord. Amen. Emily Pohl is a graduate of Siena Heights University with a degree in Professional Communications. She became involved in University Christian Outreach in Lansing during her sophomore year of college thanks to the coaxing of several friends. Currently, she works at a non-profit in East Lansing, where she works with philanthropists to ensure the continued success of community members of all ages. More importantly, the things that make her life most joyful are: spending time with her boyfriend and their families, singing, going on coffee dates with close friends, swing dancing, picnics, and reading sci-fi and fantasy literature. She also enjoys going for hikes, watching Lord of the Rings or Jane Austen movies, creating detailed to-do lists and discovering new information however possible. 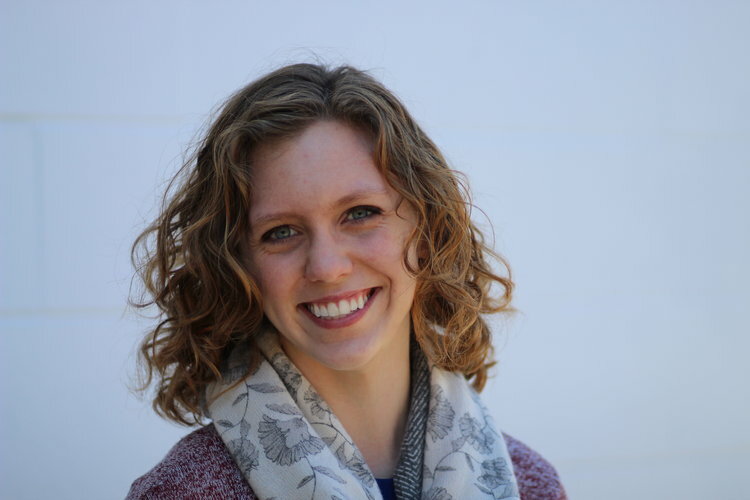 Emily hopes to share God’s joy with the people around her as she navigates life after college and continues discerning God’s unique call for her life.